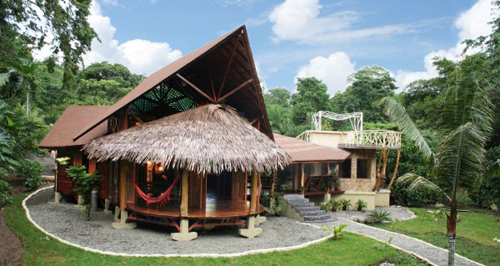 “Just don’t tell too many people about this place, okay?” asked a guest hopefully at the Costa Rica Tree House Lodge. Funny he should ask that, since The Guardian named it number one of Five Best Tree Houses in the World in 2005. The word, as they say, is out. Despite its discovery by the likes of The Guardian and HGTV’s Extreme Homes, Costa Rica Tree House Lodge maintains its unpretentious charm—a reflection of owner Edsart Besier’s personality. He acquired the first bit of the now 10-acre property back in 1999. Located mere steps from the idyllic Punta Uva beach in the Gandoca-Manzanillo Wildlife Refuge, it was nothing but a bit of swampland at the edge of the Caribbean. He drained the swamp and replanted it with native tropical ferns, palms and flowers to create a veritable Garden of Eden. 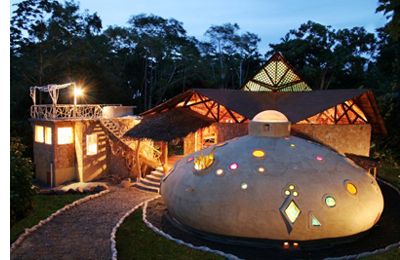 After arriving in Costa Rica with no plan other than to be closer to nature, Besier has managed to create an exclusive retreat that has low impact on the environment, substantively gives back to the community and nature, and appeals to both adventurous families and honeymooners alike. It took over eight months to find and haul out by ox the fallen hardwood timber needed to build the first Tree House. Large enough to accommodate six people on two levels with all the luxuries of home, the Tree House includes a complete kitchen, bath, and the essential hammock in the living area. Robinson Crusoe would have been envious of the bathroom tucked between the roots of the sangrillo tree it’s built around. Besier continues to add other houses to the property every year or two, including the Beach House, the Beach Suite, the Auratas House, and the soon-to-be-completed Breeze House. Most of the houses sleep up to six. 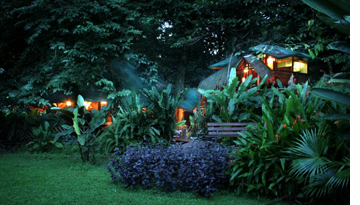 Like the Tree House, all of the houses are extremely private, and have electricity (110V), solar-heated running water, mosquito netting over the beds, linen/towel service, and many of the amenities found in any hotel. Leave your alarm clock behind (or bring earplugs), as the howler monkeys will wake you with their morning greetings. Each house offers something a little different—from the playful, artist-conceived, 800 sq. ft. bathroom in the Beach Suite to the nightly firefly show best seen from the upper deck of the Auratas House. Another curiosity within the main Tree House complex is the Iguana Verde Foundation, established to give something back to nature. Here Besier recreated the natural habitat of the green iguana. For a couple of hours every Tuesday, Thursday and Saturday, Besier leads tours of this sanctuary. Those iguanas that don’t escape are raised and released back into the surrounding wilderness. Part of the beauty of this place is in the variety of activities available—from reading in a hammock and sunbathing on the beach to surfing the infamous Salsa Brava in nearby Puerto Viejo or world-class white water rafting on the Pacuare. And don’t forget that the hotel is in the middle of a wildlife refuge that offers tours of the wetlands. In Manzanillo and Puerto Viejo, just a few minutes walk from the Tree House Lodge, guests can shop, rent scooters, bikes and kayaks, learn to surf, enjoy the local Afro-Caribbean-influenced cuisine, and get online. From SJO: 4-5 hours drive. Arrange a driver through the lodge ($165 for two). 5 Reasons to Vacation in Cozumel!